Before you make any choice, there is a period, however brief, of consideration. And simply disliking how you acted that “one time long ago when you mistreated someone” can influence you and turn you in a different direction than the path you would’ve chosen otherwise. This does not mean that the thought of mistreating someone does not enter into your head. It might. But ultimately, how you decide is not just based on the whims of that one nasty side of yourself. Your memory of your regretted actions also play into it. What this means is that just because you made a mistake in the past doesn’t mean that you will make that same mistake again. Simply having lived the consequences and aftermath of your choices will affect your choices for the future. No, you don’t know what choices you WILL make, but heck, if you later find out that those yet-to-be-made choices were “bad”, you’ll make new choices after that which will reflect your new perspective. So why is it a problem to worry about the mistakes you haven’t made yet? Because then you’ll be constantly fearful around certain life issues. If you doubt your ability to make choices, you’ll be paralyzed! You’re constantly making choices, because you’re constantly facing new situations. Life is one big ever-changing situation. Do you want to be constantly cutting yourself down because you’re not sure if you’ll make a bad choice in some unknown future? Really, experience has an effect on you – so let’s take a look at proving to ourselves that this is the case. The following exercise is designed to help you come to terms with your current ability to handle past situations that you handled badly. You’ll go back to a mistake and imagine yourself dealing with the situation given everything you know now. Write down every step or just think through it. Think of mistake you made in the past, something you would not consciously choose today. Something you vividly remember. Replay the event: If confronted with the same situation today, right this very second, with your new perspective and all your experiences (including everything to do with the incident! ), how would you respond? This is pretend, but try to be as realistic as possible. Do you see how knowing what has happened in the past affects your actions? What did you do differently? If you didn’t do differently, why? What’s holding you back from acting in the way you’d like to? You know all those worries you had about what you might do in the future? Show that worried side of you the results of this activity, challenge its fears of your future actions. This is evidence for how you will act. Do your worries still have complaints? If you still doubt yourself, be realistic – you don’t know how you’d act. Some behaviors become habits you just can’t seem to shake. BUT, what do you you think you’d do if something similar DID happen again? Would you be willing to learn from that mistake as well? Are you willing to look at the root cause of your habits? 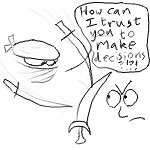 This entry was posted in Insights and tagged choice, decision-making, distrust, fear, future, past mistakes by Oliver Kaufman. Bookmark the permalink.